We are pleased to announce that we will invite Her Royal Highness Princess Sonam Dechan Wangchuck, younger sister of the King of Bhutan, to Japan for one week from October 21. This is to commemorate the friendly relationship between Bhutan and Kyoto University, which began 60 years ago. We will have the honor of her presence at our memorial symposium on Gross National Happiness (GNH) scheduled for October 25; the symposium will also be attended by President Juichi Yamagiwa of Kyoto University. 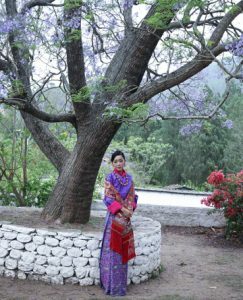 The relationship between Bhutan and Kyoto University started in the autumn of 1957, when Her Majesty Kesang Choden Wangchuck, Queen of the Third King of Bhutan and grandmother of the reigning King and his sister Princess Sonam Dechan, paid an unofficial visit to Kyoto. Formal diplomatic relations between Bhutan and Japan were still unestablished at that time. However, Professors Takeo Kuwabara (French Literature, the 3rd president of the Academic Alpine Club of Kyoto,) and Johji Ashida (Botany) of Kyoto University welcomed the Queen upon learning her visit and guided her in various places including Kyoto Imperial Palace. This led to the first Japanese visitor to Bhutan the following year: Botanist Sasuke Nakao, a graduate of Kyoto University and then Assistant Professor of Osaka Prefecture University, conducted field work in Bhutan at the royal invitation in 1958 and published a book titled “Unexplored Bhutan” (1959, available in Iwanami modern library) which won the Nihon Essayist Club Prize. The friendly relations between Bhutan and Kyoto University continued and expanded. In 1985, the team of Kyoto University Bhutan Himalaya Expedition, led by Professor Ryohei Hori of the Faculty of Pharmaceutical Sciences, achieved the first ascent of Mt. Masa Gang (7,200 m). The Kyoto University Bhutan Friendship Program (KU-Bhutan) was launched in 2010, subsequent to the meeting with the Fourth King of Bhutan who was known as the advocator of GNH, and since then the Program has been promoting academic exchanges in a wide variety of fields, such as the environment, healthcare, ecology, education and disaster prevention. It is still fresh in our minds that in the autumn of 2011 the reigning (Fifth) King and Queen of Bhutan visited the areas devastated by the Great East Japan Earthquake and encouraged many people with their kind words. HRH Princess Sonam Dechan Wangchuck has a degree in international relations from Stanford University and a masters in law from Harvard Law School, and now assumes an important post in the judicial circles of Bhutan. Her last visit to Japan was in 2004, with her mother Queen of the Fourth King. During her upcoming second visit, HRH is expected to deepen exchanges with the Japanese imperial family as well. We at Kyoto University sincerely hope that the lasting friendship between Bhutan and Japan will become even stronger with this opportunity. * On the occasion of the visit of HRH, “The Mountains and Culture of Bhutan” photo exhibition will be held from October 16 through 30 at the University Lounge (Kyodai Salon) of Kyoto University Clock Tower Centennial Hall. * This invitation project was supported by the Kyoto University President’s FY2017 Discretionary Fund for “Bhutan and Kyoto University 60th Anniversary Memorial Events: Symposium on GNH with HRH Princess Sonam Dechan Wangchuck” (member organizations: Institute for Advanced Study, Unit for Himalayan Studies, Center for Southeast Asian Studies, Primate Research Institute, Graduate School of Education, Graduate School of Medicine, Hall of Global Environmental Research, Kokoro Research Center).